BlueCross BlueShield of North Dakota (BCBSND) is the largest provider of health care coverage in the Peace Garden State, insuring more than 350,000 residents and 75,000 non-residents. When this not-for-profit mutual insurance company experienced slipping market share in their aging business block, they sought a partner with proven insurance marketing expertise — especially in direct marketing — to pull them out of their slump. Their goal? Increase the number of leads and conversions to win back market share in the Medicare Supplement arena. BCBSND’s existing aging into 65 or “birthday” program wasn’t dishing up the results it needed, and a lack of active marketing to other segments also hurt their market share. Missing a strong call-to-action, the creative was on the nostalgic side and didn’t provide much useful information to its recipients. It was time for a major revamp. This population is typically unaware if their current provider even offers coverage options once they turn 65. Brand loyalty in this age group is decreasing as more people shop around, which validated the necessity of a switcher program. A larger percent are working longer to get insurance through their employer. Those nearing their 65th birthday receive a barrage of information about Medicare Supplement and Medicare Advantage plans. This can be a confusing and overwhelming time for seniors. However, when done the right way, direct mail can be a powerful tool for influencing this older demographic. It can help attract new customers, sell more products to current customers, and even persuade prospects to switch brands. Educational and informative in our approach, Johnson Direct’s fresh “Straight Talk”-themed creative featured consistent messaging that resonated with seniors. We positioned BCBSND as leaders and experts, highlighting their attractive rates and thorough knowledge of Medicare Supplement coverage. Each piece had a similar look and feel, driving home these key messages: monetary savings, outstanding service and freedom to choose. Knowing that all Medicare Supplement plans offer the same benefits by law, we chose these main ideas realizing that price, provider choice and customer service are reasons people opt for one plan over the other. 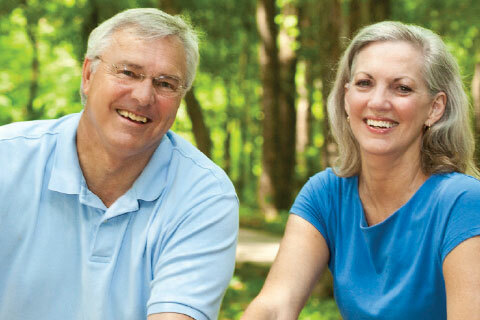 We also included a dual, no obligation offer — a FREE pedometer and Medicare planning kit. Five months into the campaign, we recommended trimming the five-piece series down to three, after learning that earlier mailings pulled in the most responses. For the switcher program, we executed a series of three mailers using creative similar to the birthday program, but hitting harder on competitive factors, such as price. The envelope teaser copy for these pieces proved to be an irresistible invitation to non-members. The Working Longer campaign featured creative that underscored BCBSND’s low rates and wide array of plan options. We also asked prospects to fill out a short survey about their future retirement goals, and in exchange for their time, we offered them a free gift — a helpful and fact-packed book to aid in healthy living. The second mailing included an extra perk — a refrigerator magnet to help keep BCBSND top-of-mind. Our strategy and creative established new controls that are helping this Blue plan gain market share again. Not only were these campaigns successful in generating qualified leads, they produced the necessary conversions to substantially impact this insurer’s bottom line. Are you experiencing similar dilemmas marketing to your aging-in audience? Or perhaps you need help attacking a different market or launching a new product? Call us. Who better to boost sales than an agency with a real understanding of the insurance market and a firm grasp on the tactics and formats necessary to achieve solid results.